What you see pictured above is possibly the ugliest “haircut” ever. But one black barber in Oklahoma wasn’t going to deny a white customer his Confederate-flag request, even though he initially thought it was racist. Corey Sutter of Fade N Up posted the customer’s photo on Facebook, and it immediately went viral. He says that his shop is open to all people, even those with differing political views. “I was thinking it was some racist-type stuff, but as he sat down and I was doing it and he was talking to me the whole time, and he explained to me why he was doing it, like, he was a really cool guy, and I didn’t feel like he was racist at all,” said Demontre Heard, a barber at Fade N Up. 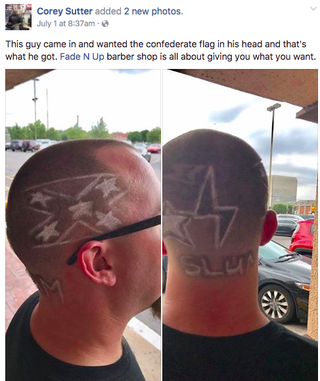 According to Heard, the customer did it because he was a fan of the rapper Yelawolf, who has a record label named SlumMerican. Responses on the Facebook post varied, with some saying that the shop was stupid to even bother with the haircut, but Sutter says it’s their job and what they do for a living. “We provide a service for this person, and that’s what we’re supposed to do. Yeah, we could have denied it. Yes, we could have acted a fool and talked bad to him, tried to fight him or anything like that. But he came in, he came in respectful. He wanted it,” Sutter explained. In the end, a horrible haircut is horrible, but maybe the barber is sitting back and laughing at how ridiculous it actually looks.